New York needed more clean safe drinking water. The Problem: how to do it at a reasonable cost. There was a unique plan to build a massive reservoir underground in the Bronx, New York. A top-flight team of engineers conceived and designed the concrete tank. The massive concrete structure that would hold the water had to be resistant to an earthquake that could crack the concrete tank holding the water and cause serious flooding and damage threatening lives and property. The recent earthquake in Italy sadly brings home the point of the devastation to structures not designed to withstand quakes. ASTM D 1752 preformed expansion joint filler was the rigid specification that the sponge had to meet. The plan was to encase the entire reservoir tank in a safety blanket of sponge to absorb any possible movement from a quake or any other earth event. The thickness was to be a minimum of 2”. As the design, engineers researched a material and a supplier two important priorities were cost and a reliable supplier with a record of accomplishment of past large projects. The engineers chose Monmouth Rubber and Plastic Corp. Monmouth’s experience around the world in places such as Kuwait, Saudi Arabia, and many water control dam projects in the USA over the past 30 plus years gave the reservoir decision makers a feeling of confidence. 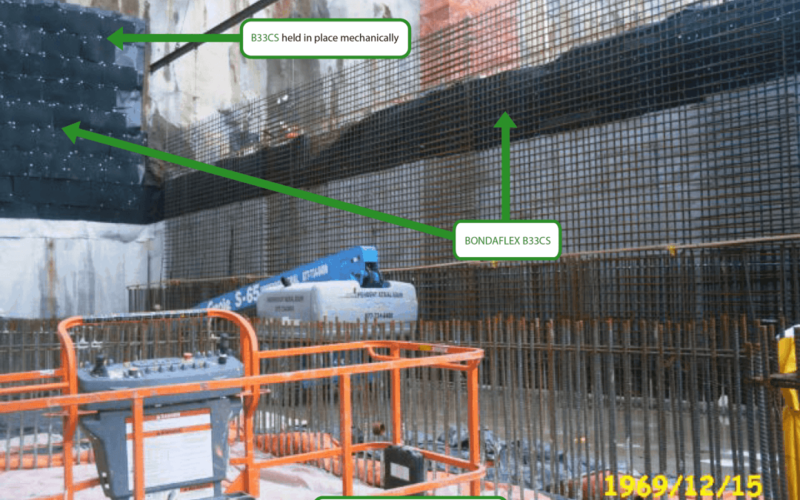 Bondaflex B33CS came in cost-wise well below conventional open cell sponge and allowed the project to invest the savings in other critical items that the project needed. Need more information on The Croton Reservoir Project?